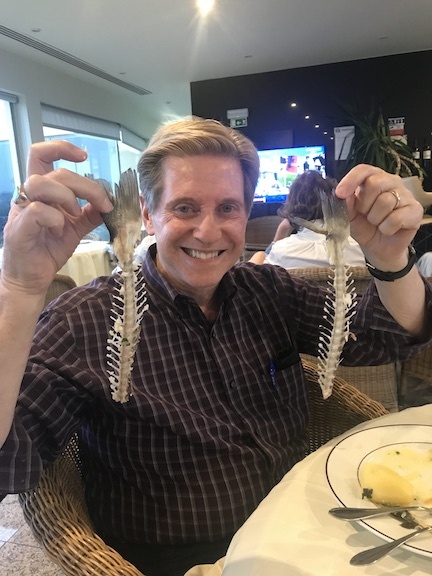 It was a quiet day in Madeira with no special activities planned. 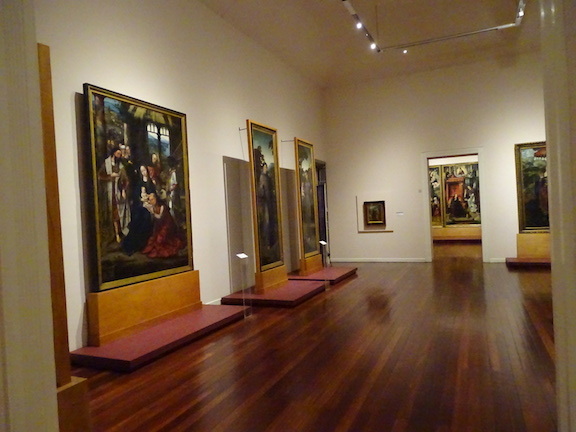 We took a walk into town and visited the museum of religious art where we saw an interesting collection of art from the last several centuries. They have on display an extensive collection of silver used in churches and for religious services….things like chalices, crosses, sepulchers, communion trays and vessels, candlesticks and more. 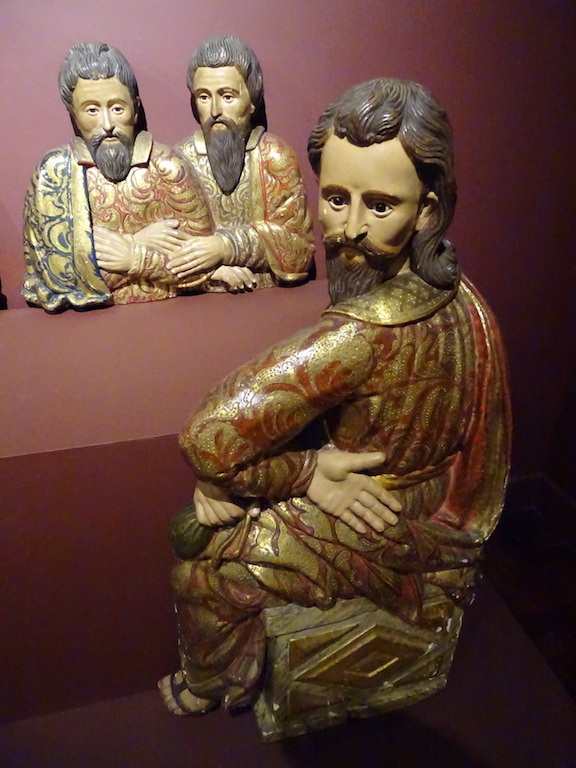 The collection also contains many wood carved figures and altar pieces. Of most importance is the extensive collection of Flemish paintings from the 15th and 16th centuries. They also have some interesting pieces of jewelry and vestments. After our visit to the museum we did a little window shopping in town and had a bite of lunch with Sue and Cindy at a small sidewalk snack bar. We had ham and cheese sandwiches for two-euros each. After a bite to eat we returned to the hotel for a rest. At 6:00pm we met up with our entire group at the language school for the second installment of a lecture on the local history and culture by a lady named Emke. After the lecture about nine folks from our group ended up at a local restaurant called Theo’s for dinner. This is one of Kent and Christine’s favorite restaurants in town and it did not disappoint. Kent had a cheese plate while Mark had the roast duck breast served with sweet potatoes and a medley of vegetables. Our table mate, Karen, from Hawaii had the octopus which did not look especially appetizing but was extremely tender and tasty. She eats octopus regularly and said that it was the best that she has ever had. The restaurant had a local pianist who played the entire time that we dined. This day four of us (Mark, Kent and Sue, with Marcelo driving) visited the small town of Curral (Corral) das Freiras with a population of only about 2,000 residents. This small town is located in a deep valley surrounded by steep mountain slopes in the interior of the island and was originally only accessed by semi-nomadic shepherds and slaves who gained their emancipation or escaped servitude. They built small homes and a small hamlet developed towards the end of the 15thcentury. Today the steep hillsides encircling the town are used for the cultivation of cherries and grapes used in the production of Madeira wine. We visited the charming small church and adjoining cemetery which is beautifully maintained and was blooming with hydrangeas. At a local souvenir shop we had a coffee and pastry along with a complementary sample of three liquors made in the area. The first was a cherry liquor, the second a eucalyptus liquor and the third a chestnut liquor. None of us really enjoyed the samples. After the coffee we took another short drive to the top of the mountain where we enjoyed the scenic overlook of the town. The weather at the top of the mountain was partly cloudy as the clouds swirled around the mountain tops. Not great for photos. In the afternoon we visited the language school where some of the people in our group are studying Portuguese. One of the teachers presented the first of a two-part series on the history of Madeira. After the lecture we returned to the local bar and café near our hotel for a happy hour. Kent and Christine Zimmerman, our group leaders, treated us to wine, beer, mojitos, burgers and chips before returning to our hotel for the evening. In the morning with Sue, we took a van driven by Marcelo out to the local cemetery called the Cemiterio de Sao Martinho or cemetery of St. Martin. 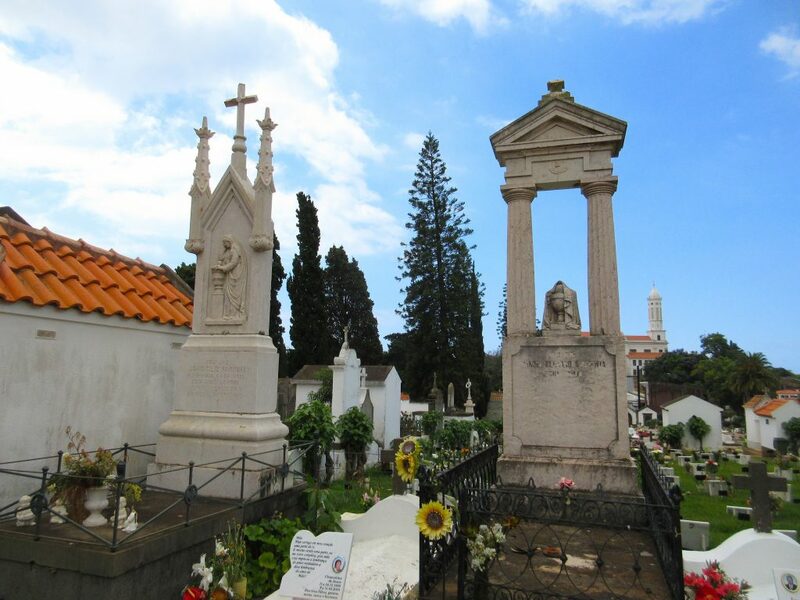 This is the largest cemeteries in Funchal where many of the well-known families of Funchal have been laid to rest. They have family sepulchers or small ornate sheds where you can find racks on either side that hold eight caskets per small structure. You also can find many urns of ashes inside of the family plots. In addition to the old wooden caskets many of these sheds are ornately decorated inside and out. The exteriors often have art nouveau or neo-gothic styles dating back to the 1800’s. The interiors of the structures are sometimes adorned with ornate ceramic tiles, many photographs, as well as both fresh and artificial bouquets of flowers. The cemetery also has smaller above ground vaults that may be ornately decorated with statuary and flowers as well as photographs of the deceased. Besides the above ground vaults there are three additional vaults under each vault to provide more space for families’ loved ones. If you can’t afford either of these options there are the traditional burials in the lawn with a small headstone marker, the wall vaults or even stone vases of flowers with the names of the deceased and a photo of them. 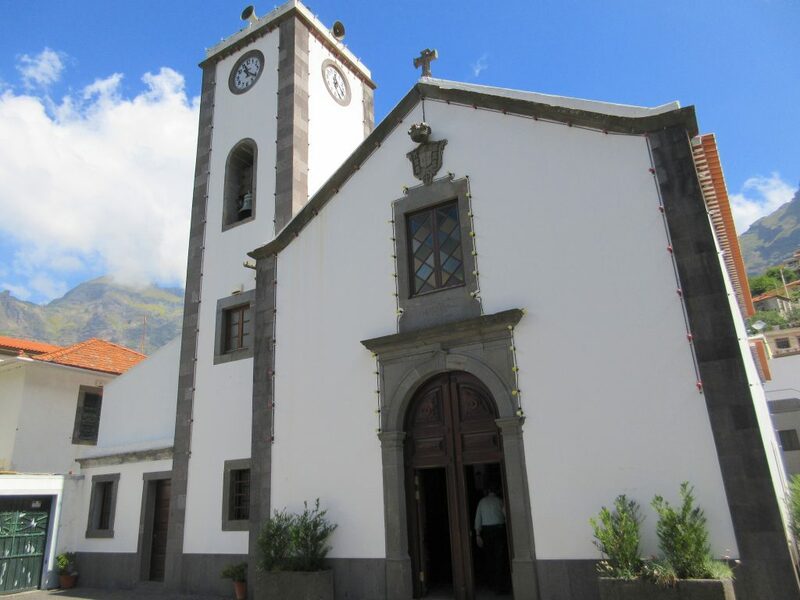 Our next stop was the nearby church of St. Martin located on a prominent hilltop overlooking Funchal. A previous church of the same name had been located nearby until 1883 when a parishioner died and left almost all of his fortune to the church. 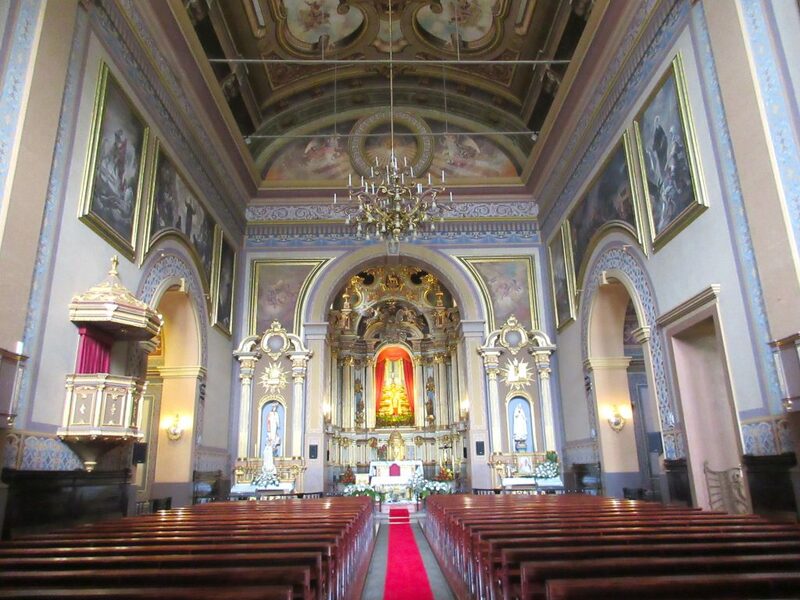 The current church was inaugurated in 1918 and just celebrated its hundredth anniversary on June 24. 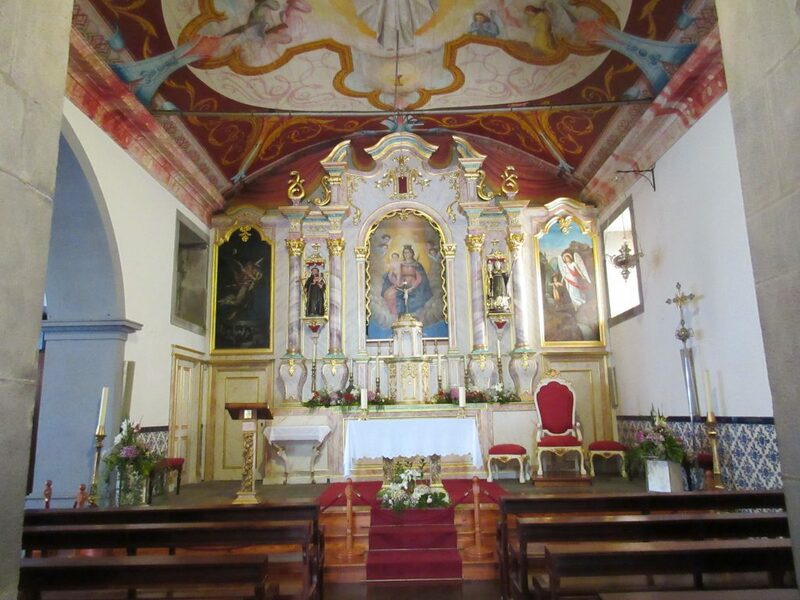 The church is quite simple on the exterior although once you enter the church you are taken by its high ceilings, exquisite murals, glistening wooden floors and pews. 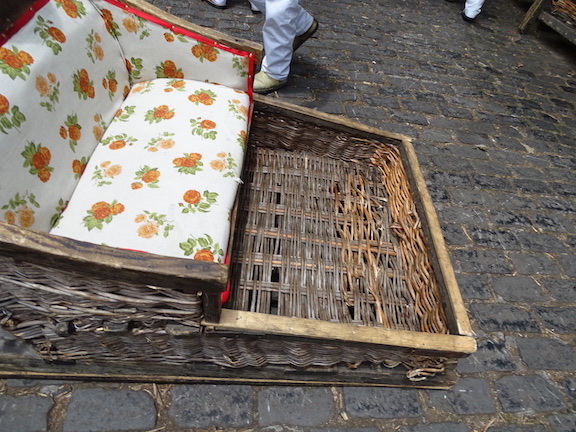 It is very tastefully decorated without being too gaudy even though there is a lot of gold used throughout. After our visit to the church we had lunch at a local restaurant along one of the restaurant row streets with our friend Sue. Mark tried the local specialty called Espetadas which are grilled marinated meat on a skewer. They use chicken, beef and pork for the skewers. Mark tried the pork which was tender and nice. 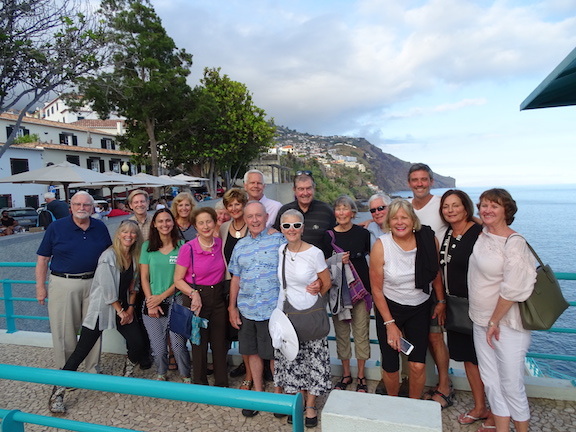 In the afternoon we met with our entire group at the Blandy’s winery in the center of town where they make Madeira wine. This particular winery has been here for 200 years and owned by the same family (seven generations). We had a tour of the winery in Funchal although today much of the wine making is done at another location outside of town. They have a very nice museum documenting the long history of this family business and their famous Madeira wine. 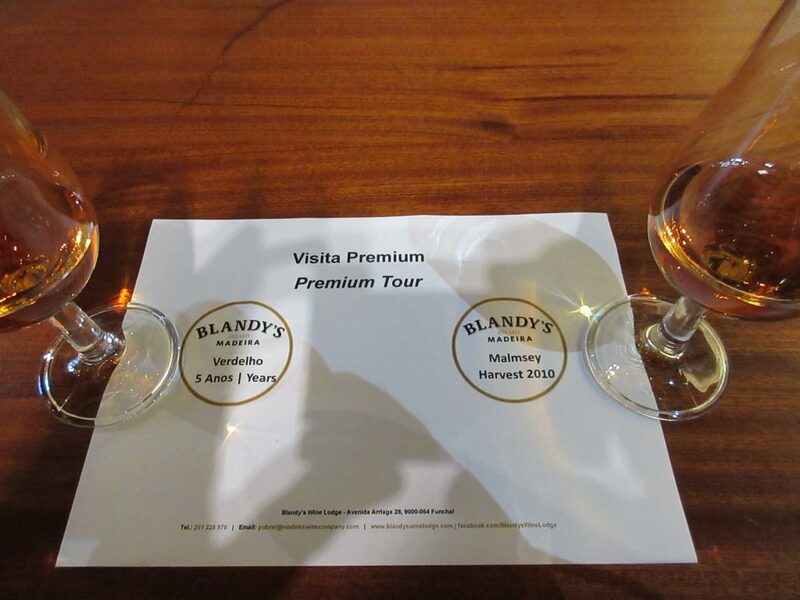 After the tour of the winery we had a tasting of two of their Madeira wines and one white table wine. There were few of us who liked the taste of any of the wines but it may be that it is an acquired taste….or terrible wine. The Madeira wines are extremely strong, reminding us of cough syrup. Even the white table wine had a strong sulfur odor and not very nice tasting. They say that the Madeira wines will not age in the bottle so they will last on the shelf for a lifetime or longer. After the winery tour we met up with four others (Cookie and Vince; Natalie and Jan) from our tour group for a bite to eat at a local hamburger restaurant that was very good. The French fries had the skins on them and were sprinkled with herbs. Kent and Mark had the tuna sandwich which was a tuna steak with lettuce, tomato, a fried egg and sauce. It was very good. Afterwards a walk home and to bed. Madeira Day is a national holiday celebrated on the anniversary of the archipelago’s independence from mainland Portugal, granted in 1976 in the Portuguese Constitution. Official ceremonies are held throughout the Autonomous Region of Madeira, while families and friends enjoy picnics and lively local events. 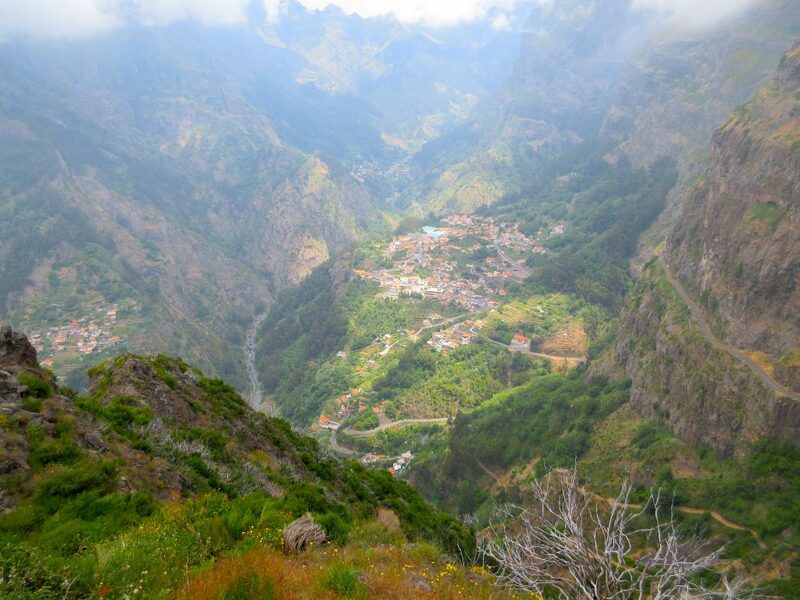 On this day we were taken in a 20-passenger bus on a tour of the western portion the island of Madeira. 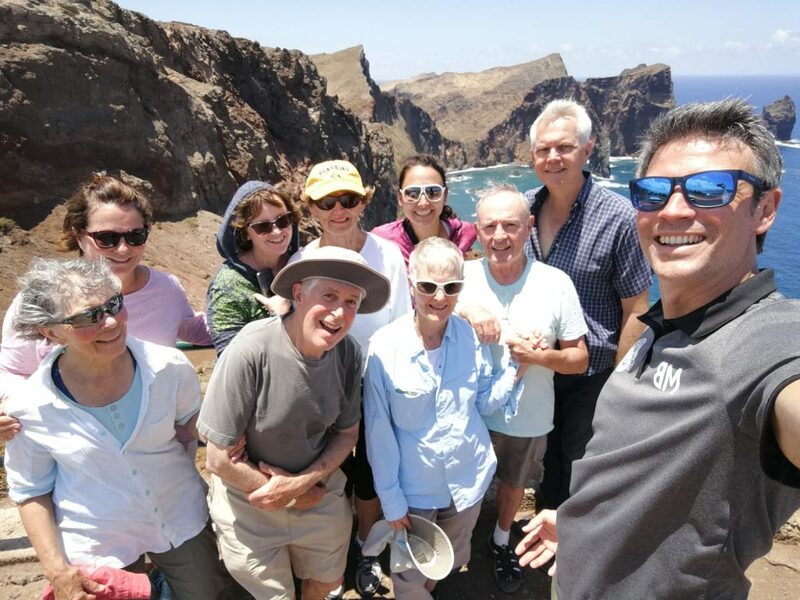 We started out at “Cabo Girao” lookout point located at the top of an 1,840-foot cliff on the southern shore of Madeira. 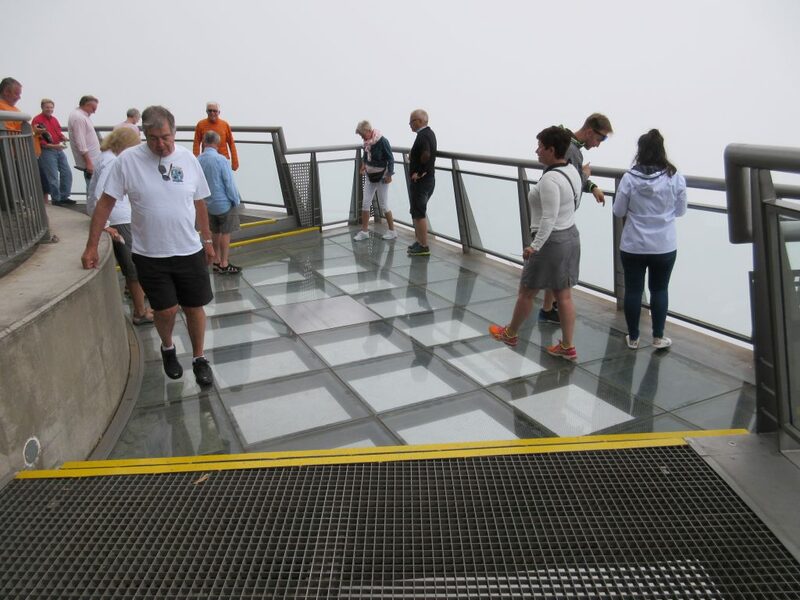 At the top of the cliff is a glass floored observation deck where you can step out over the cliff to see the dramatic cliffs and the ocean below. The lookout was built in 2012 and is similar to the glass lookout in the US over the Grand Canyon. Our next stop was the town of Ribeira Brava on the southern coast of Madeira with a population of about 14,000 inhabitants. Ribeira Brava means angry river and it was in 2010 when heavy rains in the mountains sent a deluge of water down the river to the small town at the mouth of the river doing tremendous damage. Many people lost their homes in the flood and much of the town had severe damage from the water. After nearly eight years they are just finishing building a concrete channel through the canyon to help control the water flow. 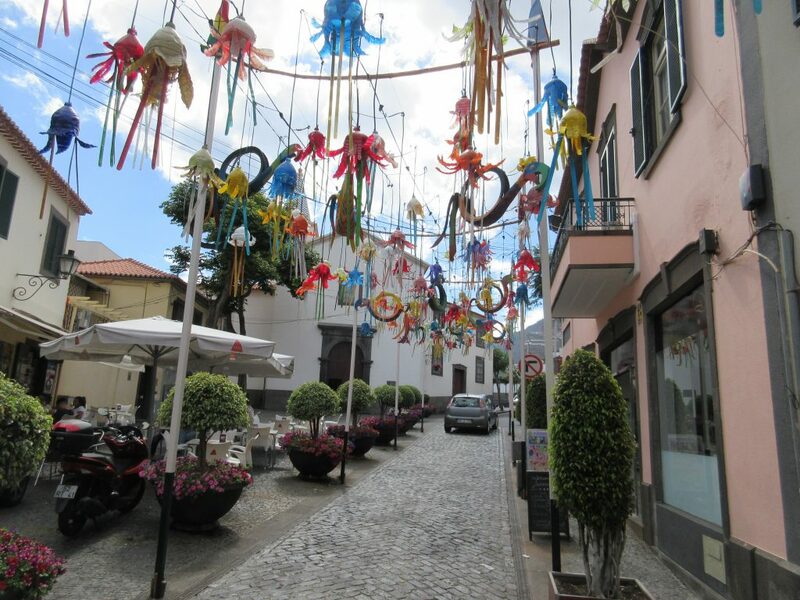 On this day the town was beautifully decorated for the Madeira Day celebrations over the weekend. 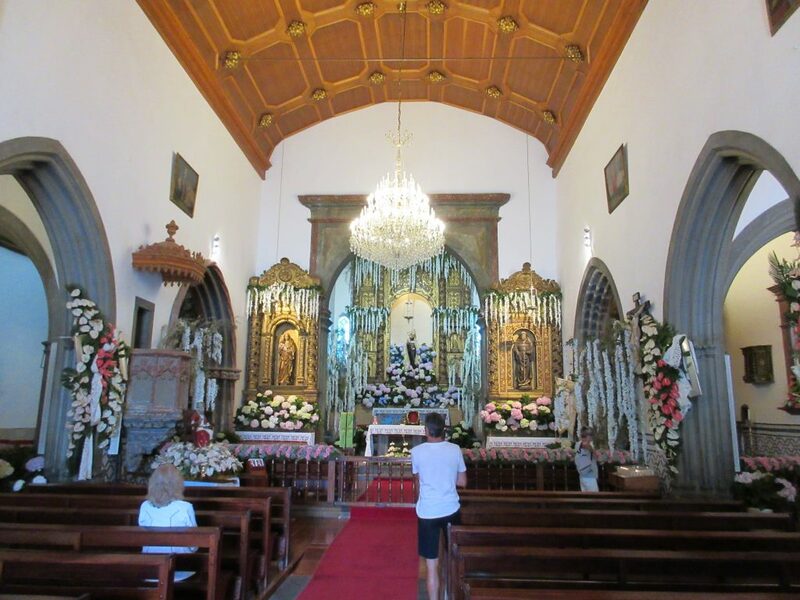 The streets were filled with decorations and the church was beautifully decorated throughout with arrangements of anthurium, carnations, cascading white flowers and hydrangeas. Next, we headed north across the island via several underground tunnels carved through the volcanic rock mountains. Once we reached the north coast the air was cooler and the sea was much rougher with larger waves and heavy seas. The terrain is very dramatic with steep cliffs dropping into the sea. We stopped to observe some of the “veils” of water falls cascading down the steep cliffs from the mountains. We then headed to the northwest point called Porto Moniz with a population of only about 2,750 inhabitants. This part of the island was known for its whaling industry from about 1941 until 1981, but today caters to tourists stopping for the fantastic views of the rugged coast. The coast line is filled with jagged volcanic rocks jutting out of the water creating small pools of crystal clear sea water. The resort style area where we stopped for lunch has created huge swimming pools out of these natural rock formations. They have concreted around some of the rock formations to create areas for sunning and have filled the rock formations with plaster like a swimming pool like you have never seen before. The ocean waves crash over the swimming pool walls creating a thrill for swimmers. We had lunch here in a couple of restaurants overlooking the dramatic coastline. We then headed over the mountains to see how the terrain of the island changes as we climbed in elevation. We saw lush green fields of ferns with rhododendrons and lush flowers. Cows wandered the roads and many birds could be found on the island. Grapevines grow on the sunny side of the island and cherries, corn, terraces of bananas, sweet potatoes and a huge variety of vegetables and fruits grow. We then stopped at the town of Calheta (small bay) on the south shore where we had ice cream. This town of about 12,000 residents has many tourist hotels and its economy is reliant on fishing and agriculture. This evening there was a mandolin concert with several youth groups playing mandolins, flutes, etc. and singing. As we walked by the concert area, we saw there were some chairs still available and we took seats and stayed for most of the concert which was augmented with video of each of the performing groups. We then took a short walk to a restaurant where we had dinner. It was a long day on the bus but was great to see all the island has to offer and how different the landscapes can be. It was a Saturday and the majority of our group had the day off from the Portuguese language classes they are taking each morning from 10:30-12:30. Mark and nine others took a van to the eastern most tip of the island where there is a hiking trail called the “A Ponte de Sao Lourenco” with spectacular views of the water and cliffs. The hiking trail was well marked although the terrain was very hilly and strenuous. The sign at the entrance to the trail claimed that it was only 3.2 kilometers but it took us two hours to reach the tip of the island and ninety minutes to return. Kent went shopping in town with Sue and Natalie. Sue and Kent had ham and cheese sandwiches for lunch! After an afternoon of relaxing from the hike we were treated to a wonderful dinner at our hotel. This weekend in Madeira they had many festivals including a celebration for the autonomy of Madeira from mainland Portugal in 1976. Each Saturday night during the month of June the city allows four different countries to put on a firework show as a part of an International Fireworks Competition. After the four countries have put on a show the public votes for the best show. Once the votes are in the company with the most votes is allowed to put on the Atlantic Festival fireworks show, said to be the largest in the world (the one we saw). The dinner at the hotel was a large buffet for about 100 guests out on the terrace overlooking the city and the seaport. There was a soup and bread station where they served the local Caldo Verde Soup made with potatoes, olive oil, collard greens and sausage. Next was a salad bar with a green salad, apple salad, chicken salad, Jell-O salad, etc. For the main course they served steamed vegetables, rice, sweet potatoes and grilled meats. The meats included two types of sausage, fish, pork and beef. The desserts included a delicious coconut cake, chocolate cake, flan and more. They also served wine during the entire meal followed by coffee and Poncho. The Poncho drink is made with distilled cane sugar, lemon juice, orange juice and honey. After the extravagant three-hour dinner, we enjoyed the fireworks display which lasted twenty minutes. It was synchronized to music but at our hotel we were unable to hear the music. The fireworks were nothing spectacular to us as we have fireworks in San Diego all year round but it was enjoyable. On this day we took the cable car “Gondola” from the waterfront up the hillside to a height of 1,800 feet. The distance traveled is about 12,000 feet taking about 15 minutes. There are 39 cabins with eight seats each allowing them to transport as many as 800 passengers an hour. The cable car opened in the year 2000 to replace the Monte Railway which ran from 1886 to 1943. 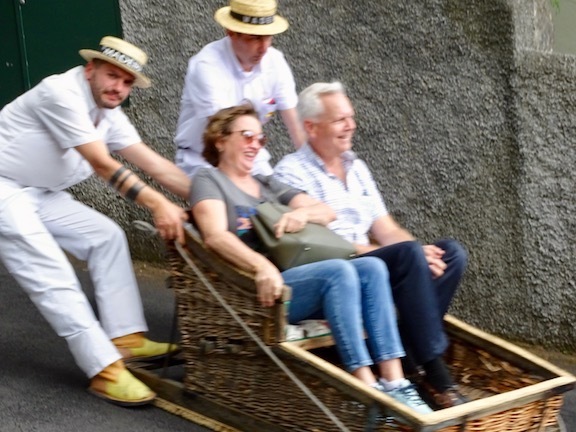 Once we reached the top of the cable car at Monte we headed for the toboggan ride. Beginning about 1850 the toboggans were a fast means of transport down to Funchal from Monte for locals. The two-kilometer downhill journey takes about ten minutes and reaches speeds of nearly 50 kilometers per hour (30mph). 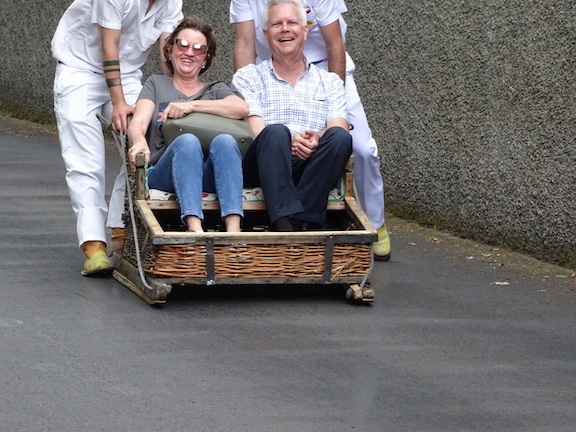 The toboggans are two-seater wicker sleds with wooden runners, pushed and steered by two men dressed in traditional white cotton clothes and a straw hat. They wear rubber-soled boots to assist them with steering and braking. The ride was a bit scary at times but fun as well. Where else in the world can you have an experience like this? Kent declined as he is accident prone! 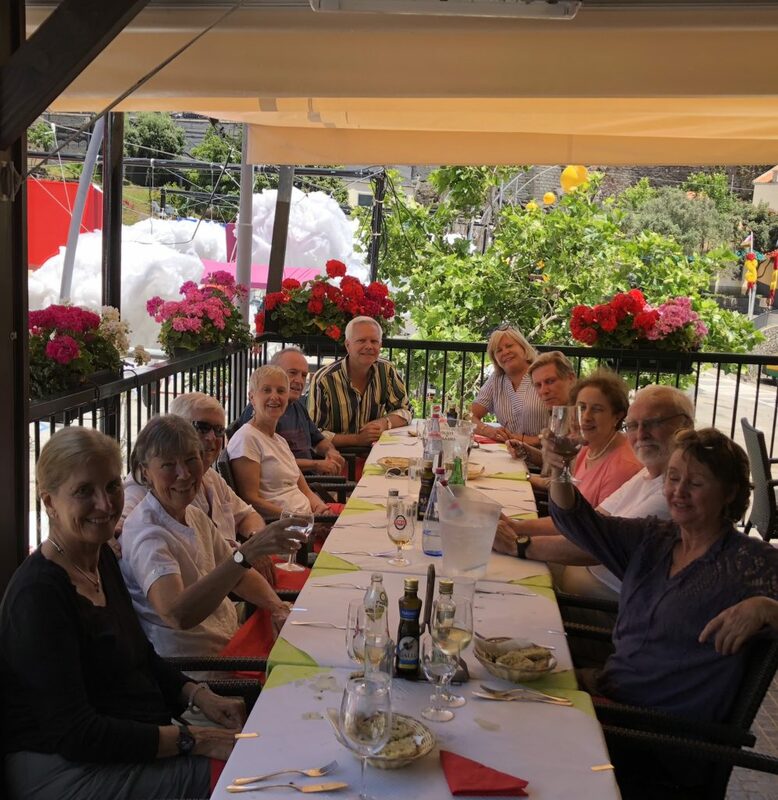 Our next stop was the Monte Palace Botanical Gardens where we had a bite to eat before exploring the gardens. The palace dates back to the 18th century when English Consul Charles Murray purchased the property and transformed it into a beautiful estate. In 1897 Alfredo Guilherme Rodrigues acquired the estate and built a palace like residence later converted into a hotel called the Monte Palace Hotel. 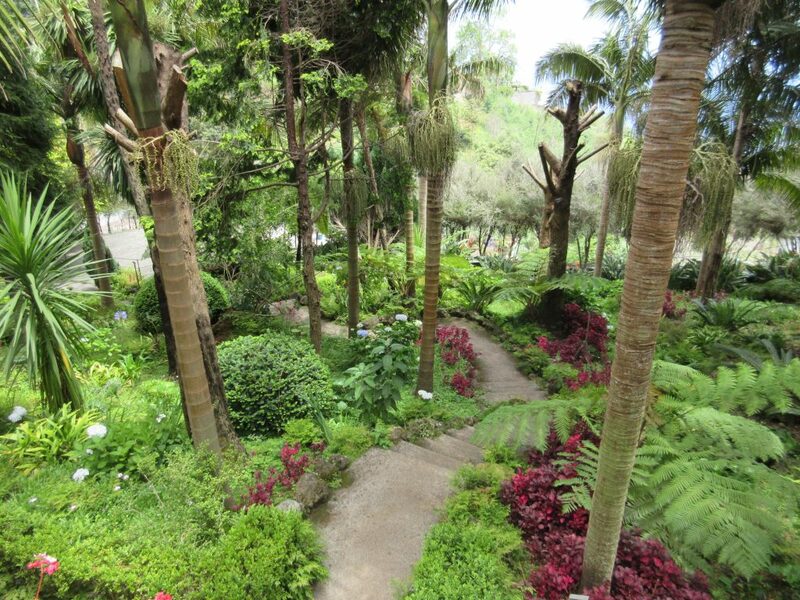 From the hotel you can take in beautiful views of Funchal and the natural surroundings. After Mr. Rodrigues’ death in 1943 his family was not interested in the hotel and it was taken over by a financial institution. In 1987 the financial institution sold the hotel to entrepreneur Jose Manuel Rodrigues Bernardo who, in turn, donated it to a foundation he created and named after himself. 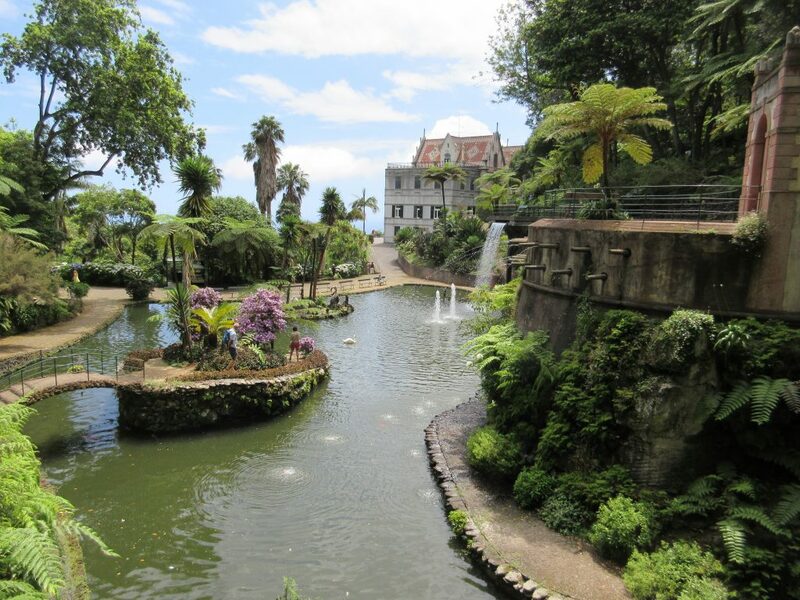 The foundation renamed the property the Monte Palace Tropical Garden adding two new lakes and expanding its already beautiful gardens. The gardens include extensive cycads, orchids, protea, ferns, cedars, laurels, hydrangeas and so much more. The gardens are quite spectacular and beautifully maintained. To explore the gardens is a bit of a hike as they are located on a fairly steep canyon with extensive paved paths and stone walkways. The lakes are filled with large collections of Koi fish and wandering the grounds are chickens, peacocks and pheasants. 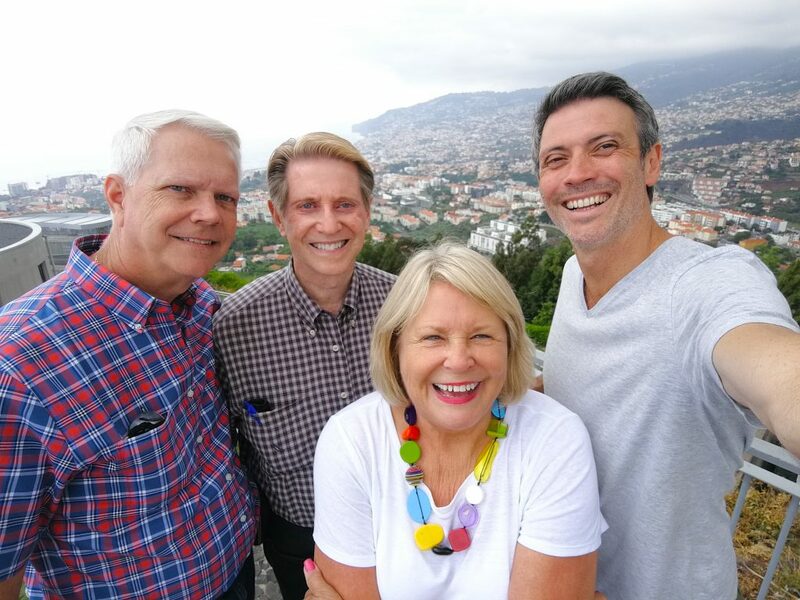 After our visit to the gardens we made our way back to Funchal via the cable car to the local historical museum called the Madeira Story Center. The museum traces the history of the island from its first discovery up to modern day through a variety of displays and exhibits. Luckily for us all of the exhibits are well documented in four languages including English. In the evening we all walked downtown to a 100-year-old bar and restaurant called the Ritz for drinks and plentiful appetizers. The upstairs bar terrace where we sat overlooks the city park across the street and it was a perfect setting for drinks. There was a light shower while we had drinks but it soon passed. Christian Ritz originally from Switzerland and who was a successful textile merchant doing business between Europe and the Americas opened the business in 1905. He had come here by accident when a ship he was sailing on was sent off course during a storm and fell in love with a local girl. We departed and went back to our hotel to bed. During the evening we spent most of our time talking with Kent and Christine Zimmerman, our program managers. Sue and Karen sat nearby. Barb, who broke her hip in Croatia, and Bob sat in the center. Cindy, Jan and Natalie decided to stay for dinner, along with Pato and Marcelo. Vince and Cookie and Lynn and David headed out to dinner to another restaurant. Maryah and Bob declined to join our rowdy group. Monday afternoon most of our group arrived on a plane from Lisbon and we met for a welcome dinner at our hotel. Our group consists of fifteen guests plus our tour leaders Kent and Christine Zimmerman from Colorado. Also, with us on the trip are a young couple from Mendoza, Argentina who now live in Spain, Patricia called Pato or “duck” and Marcello. They are helping with language classes, luggage and anything that might needs support. Many in the group are folks whom we have met on previous trips so a bit of familiarity and fewer new names to remember. Tuesday, we departed our hotel in Porto for the airport for a two-hour flight to the island of Madeira. Madeira is a Portuguese archipelago situated in the Atlantic Ocean, southwest of Portugal and about 280 miles from the African coast. 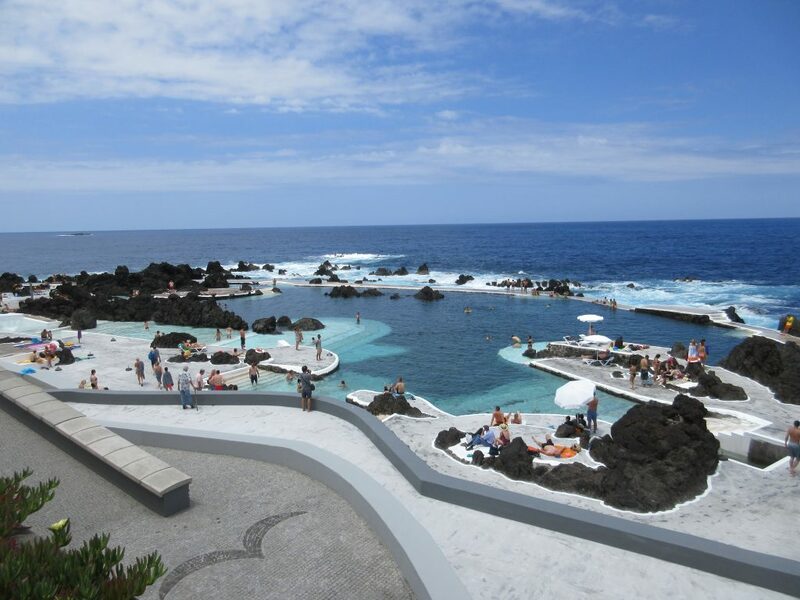 The archipelago is about 250 miles north of the Canary Islands and has a population of about 275,000 inhabitants. 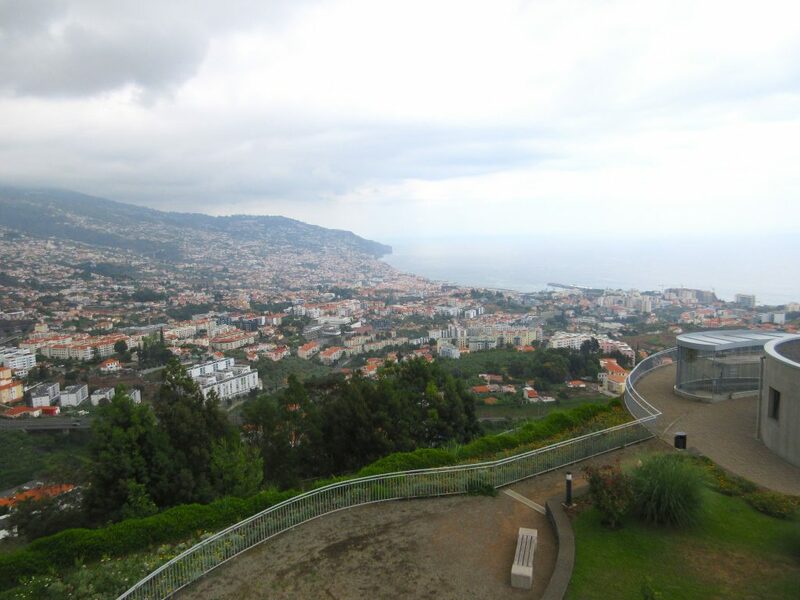 The capital of Madeira is Funchal located on the main island’s southern coast. 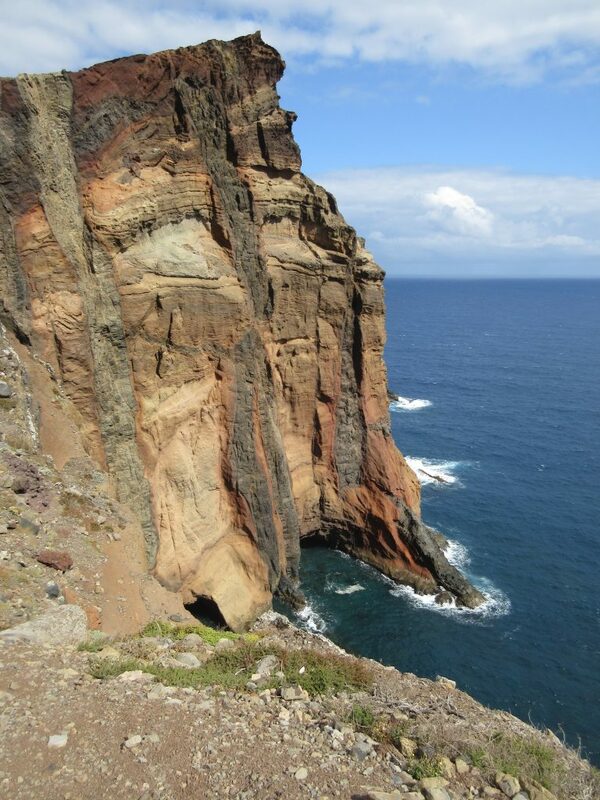 The islands are called Madeira, Porto Santo and the Desertas. Madeira was claimed by Portuguese sailors in 1419 and settled in 1420. In the 1400’s sugarcane was the island’s main economy. By the 1600’s, the lack of a labor source led to the import of slaves from Africa making up about 10% of the population. In the 1700’s the production of sugar shifted to Brazil and wine became the most important commodity. 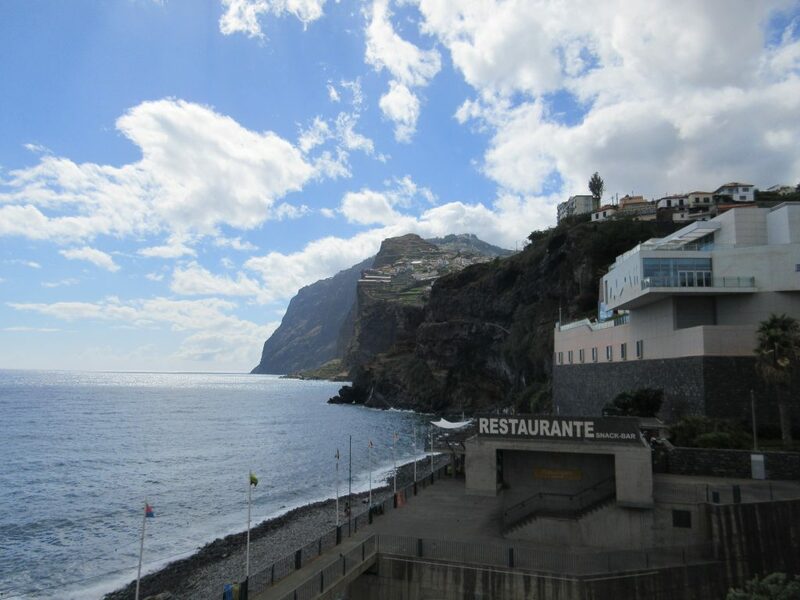 Today Madeira is a popular year-round resort visited by 1.4 million tourists annually. 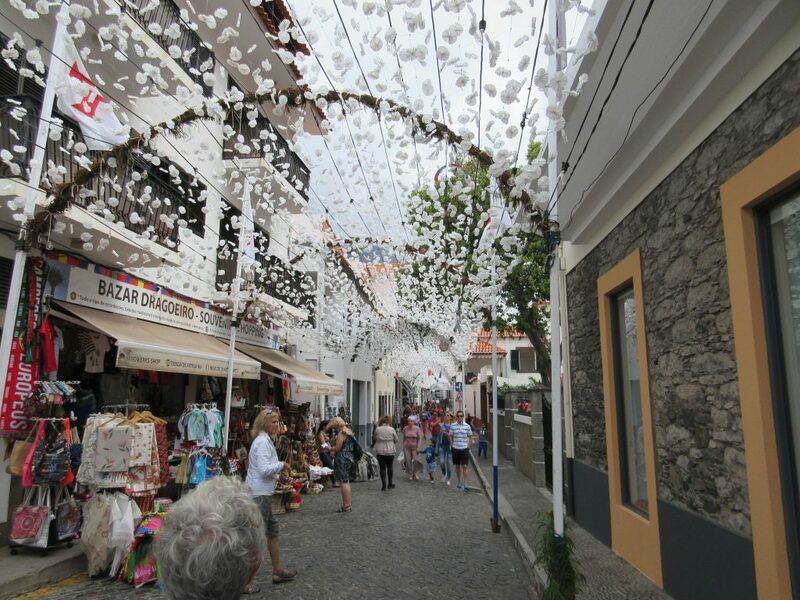 Known for its Madeira wine, gastronomy, history, culture, flora and fauna as well as embroidery. 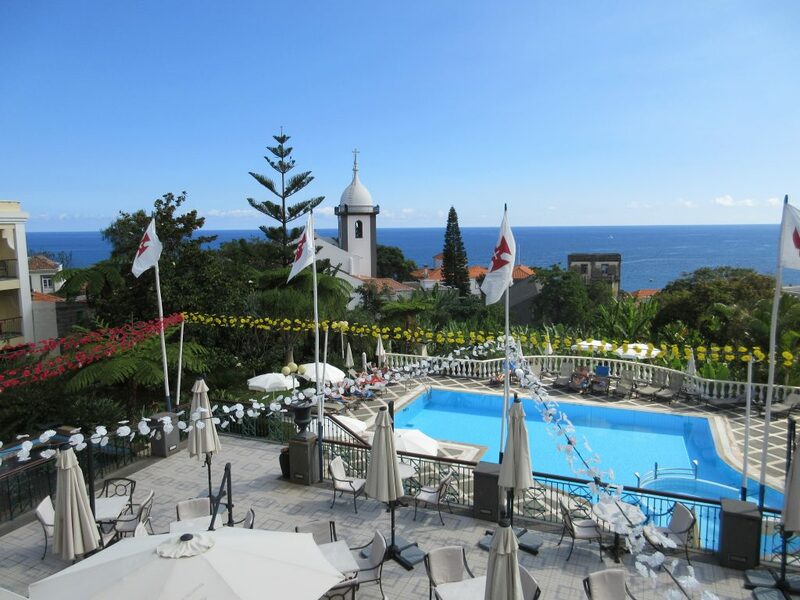 Our hotel for the next 10 nights is the Quinta Bela Sao Tiago located in Funchal a short distance up from the sea. Our room has a beautiful view of the bay and the horseshoe shaped hillsides surrounding the bay. The steep hillsides are filled mostly with white and cream-colored buildings capped with red clay tile roofs. Our hotel has a lovely outdoor terrace restaurant and swimming pool nestled amongst green vegetation. There are palm trees, magnolia trees, cypress, bougainvillea, birds of paradise, fichus trees, sago palms and roses creating a lush oasis. 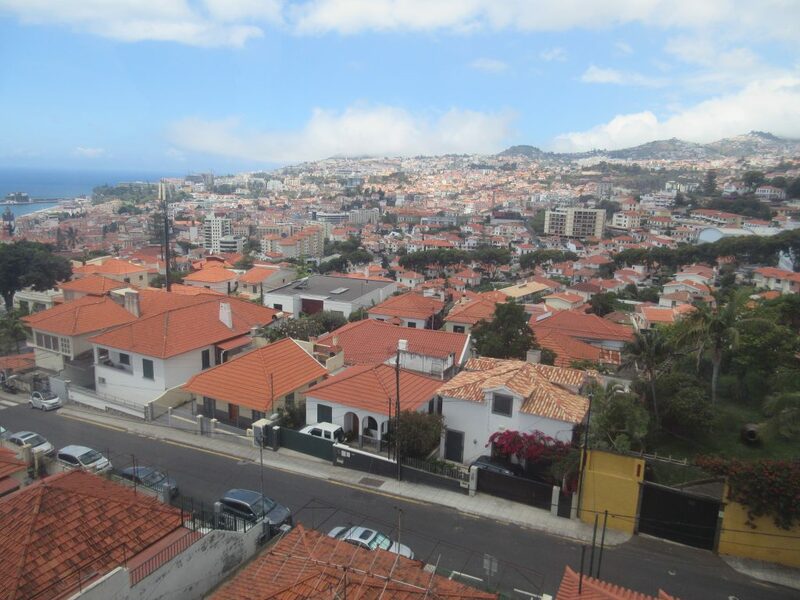 The weather in Porto had been mostly cloudy and gray although warm and then we arrived in Madeira to sunshine and 74 degrees weather. Unfortunately, the sun shortly turned to cloudy skies. For dinner we walked a short distance to the cliffs overlooking the ocean where we dined at a restaurant called Riso or Rice. Most all of the dishes on the menu consisted of some type of rice. They had many varieties of risotto, red rice, black rice, basmati rice, rice pudding and so much more. For appetizers they served puffed rice, liver pate and some bread sticks and bread rolls. For starters folks shared things like shrimp kabobs with a mango mayonnaise sauce and goat cheese in a filo dough. For entrees we had the black pork cheeks with pureed potatoes and Portuguese beans that were green and about the size of a lima bean. Everything was really delicious and the setting overlooking the sea was beautiful. For dessert we shared mango gelato, black rice pudding and tiramisu. 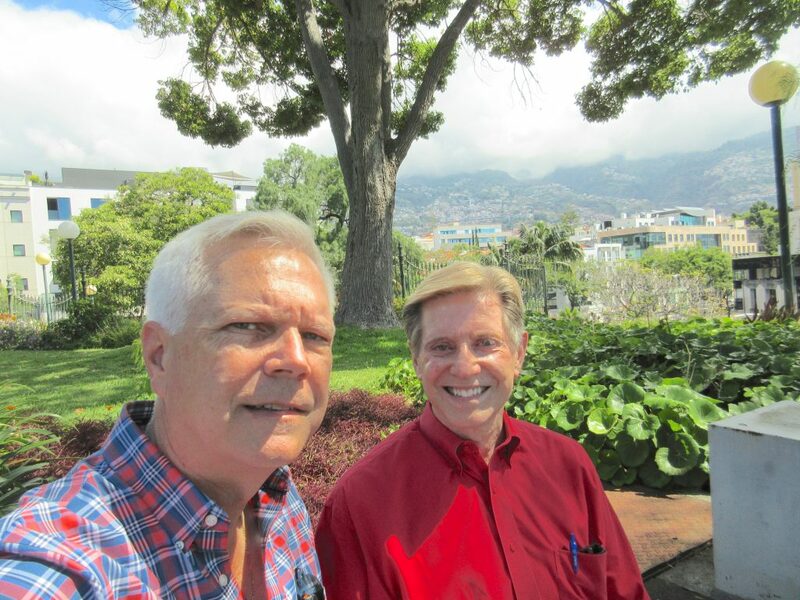 On Wednesday, Kent and I walked into Funchal to have a look around town while about half of our group studies Portuguese. It is a beautifully clean city with several city parks filled with colorful flowers, lush trees and even a lake with fountains and white swans. The buildings that are currently occupied are well maintained, nicely painted and generally feature clay tile roofs. Many of the buildings stand boarded up and abandoned from the worldwide recession of several years ago. There are narrow streets with sidewalks decorated with small black and white mosaic stones. 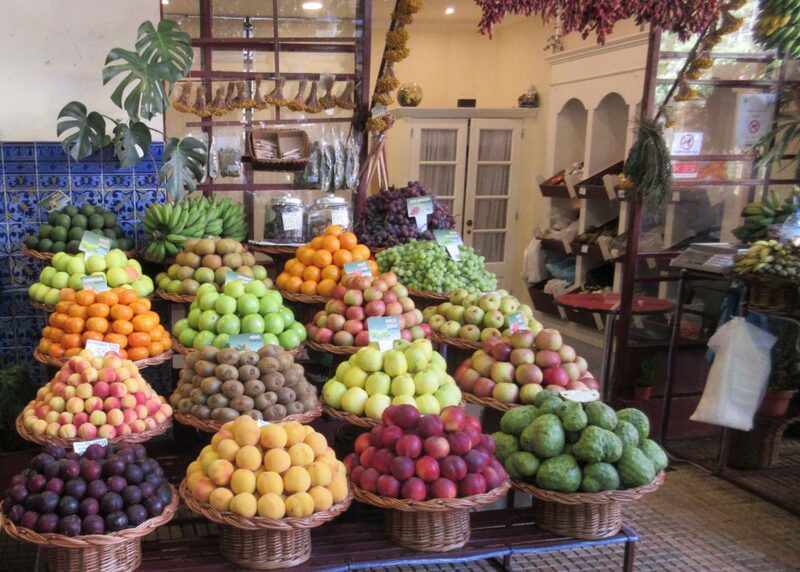 The shops are well maintained and restaurants are plentiful. We visited the main farmers’ market in a building where you can purchase fresh fish, produce, fruits, flowers and other merchandise. We were given tickets for the Hop-On, Hop-Off bus tour so we could get a good overview of the city of Funchal. The route we took around the city took us to the highest point of the city, around the downtown and to the tourist areas where there is one hotel tower after the next. In the evening we all gathered at a local outdoor bar and café for happy hour with drinks, sandwiches, fries and olives. After the happy hour some of our group went on to dinner at one of many nearby restaurants while Kent and I chose instead to indulge in the gelato before returning to our hotel for the night. Our flight from San Diego to Toronto started out poorly! When we arrived at the airport the Air Canada Rouge computer system was down. We stood at the front of the line for nearly two hours without being able to check our bags even though we had checked in online. The customer service agents made no announcements and no effort to communicate what was going on with the customers. Only when people came up to the counter and asked an agent would they find out that there was a problem with the computer system. We also learned the flight that was scheduled for the previous day never took off and that those passengers had been re-booked on a flight departing this morning. After waiting for nearly two hours the first-class passengers were manually booked on the flight that was leaving this morning. After the first-class passengers, the handicapped and those with dogs were attended to; then they hand wrote our baggage tags and re-booked us on the flight leaving today. The flight departed about two hours late but the passengers who had waited 24-hours for a flight were excited to be departing……even if it was late. After arriving in Toronto, we learned that our flight from Toronto to Porto, Portugal was also two hours late departing. The new departure time was 12:20am. 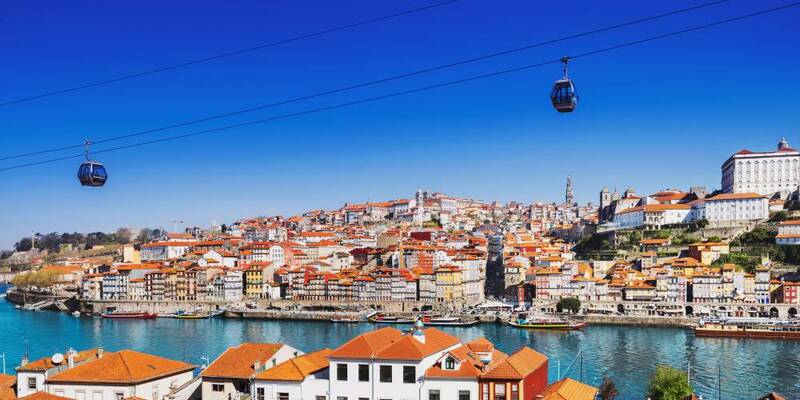 Porto, with a population of about 235,000 people, is the second largest city in Portugal after Lisbon. The city is located along the Douro River in northwestern Portugal and its historical core was named a UNESCO World Heritage Site in 1996. 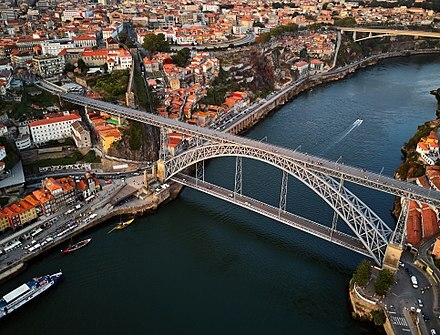 The history of Porto began around 300BC with the Celtic people being the first known inhabitants. Ruins from this period have been discovered in several areas. During the Roman occupation of the Iberian Peninsula the city developed as an important port. In the 14th and 15th centuries, Porto’s shipyards contributed to the development of Portuguese shipbuilding. One of Portugal’s internationally famous exports is the port wine named after Porto and produced in the Douro Valley as far back as the 13th century. 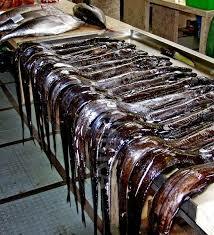 Other top exports include cork and sardines, now in season. Our hotel for three nights is the Hotel Boa-Vista located in Foz, the noble part of the city where the Douro River meets the Atlantic Ocean. The word Foz simply means beaches. Over 150 years old, the hotel was built at a time when it was fashionable for Brits and well-heeled Porto residents to go on holiday. From the mid 19th century onwards, many of the mansions which can still be seen today in Foz were built and the local atmosphere was extensively portrayed by artists and writers of the time. 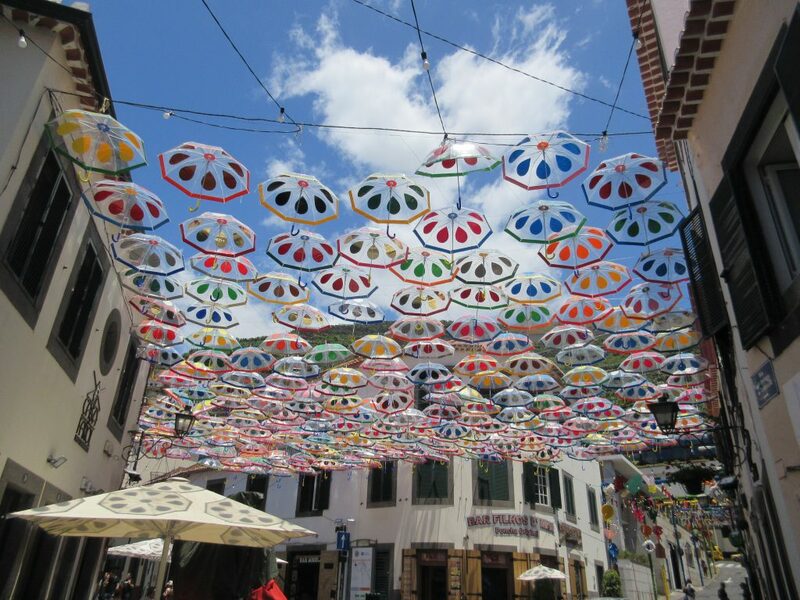 June 23rd in Porto is the annual Festa de Sao Joao do Porto or Festival of St John of Porto. The festival is to pay tribute to St John the Baptist and has been celebrated here for more than six centuries. An odd tradition among the participants is rooted in pagan courtship where they hit each other on the head with garlic flowers. Later this tradition changed as a local toy manufacturer added plastic hammers to his product line and local college kids introduced the hammers to the festival in the 1960s. Today the plastic hammers are seen throughout the city on this day and hitting one on the head wishes them a happy new year. They have many street concerts, dance parties, eat barbecued sardines, Caldo Verde soup made from collard greens, wine drinking and launch flame-propelled balloons over the city. At midnight a large display of fireworks can be seen over the Duoro River. After the fireworks and parties some folks continue their celebration by walking about four miles along the Duoro River towards the mouth of the Atlantic to watch the sunrise and even bathe in the water. Our friends Brenda and Cory Adams, who now live in Lagos, came to Porto for the weekend to see us. (Kent and Brenda attended high school in the same small town in Illinois and have remained friends.) They have lived in Portugal for the last five years and we had the opportunity to visit with them in Lisbon in 2016 when we were on a cruise to the far east. Brenda and Cory came to our hotel on Saturday where we had had drinks and dinner at the roof-top bar and restaurant. On Sunday we walked (4+ miles)into the historic core of Porto to meet up with a friend, Joakim, a pilot with Easy Jet Airlines, whom we met on the far east cruise in 2016. He and his boyfriend, Pablo, were in town for the weekend celebrations and they spent the afternoon with us. We had coffee and Pastel de Natas at a city center coffee house. These Portuguese egg tarts are originally from Portugal but today are also found in Brazil and other countries with Portuguese immigrants. The small pastries are about three inches in diameter with a crispy crust filled with an egg custard and served warm with cinnamon or powdered sugar sprinkled on top. They were delicious and we could have eaten several more. After coffee we stopped in at the 1916 train station in the center of town to view the beautiful murals on the walls. 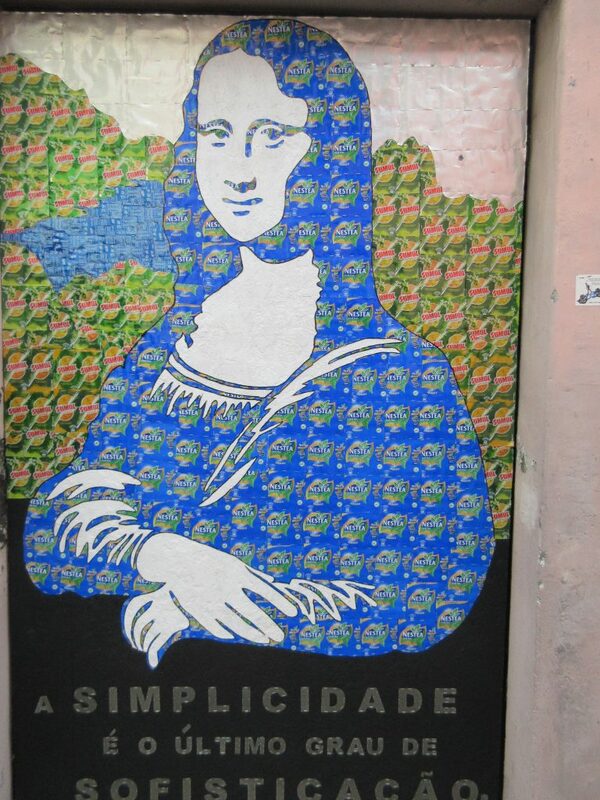 These murals are painted on approximately 20,000 azulejo tiles. The tiles are painted in blue on white tiles and are quite extraordinary. They reminded us of the ceramic Dutch tiles. The scenes depict battles, the conquest of Cueta and some generic country scenes. We stopped into a beautiful church called the Cathedral of Porto for a peak around before crossing the unusual Gustave Eiffel-inspired Bridge over the Duoro River. 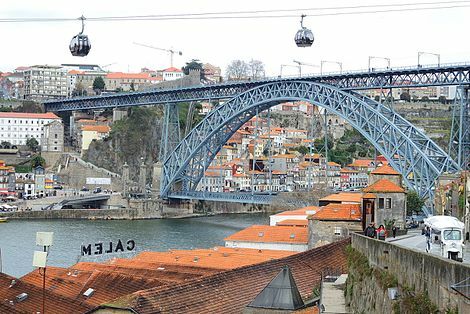 This double-deck metal arch bridge spans the Duoro between the city of Porto and Villa Nova de Gaia. The bridge spans 564 feet and is the largest of its type in the world. In 1879 Gustave Eiffel presented a project to construct a new bridge over the Duoro with a single deck in order to facilitate navigation. The project was rejected due to dramatic growth in the area. In 1880 a competition was initiated to construct a double-deck metal bridge and the committee selected a project by a disciple of Gustave Eiffel. Today the upper deck of the bridge is dedicated to public transportation by metro trains and the lower deck is used for vehicular traffic. Both decks permit pedestrian traffic and the views of the river and the city from the bridge are spectacular. Once across the bridge we took the Gaia Cable Car down to the river’s edge for a look around the area where the port wine cellars were located. The wine was made in this area and then transported down the Duoro River to the Atlantic Ocean and around the world. We left Joakim and Pablo to meet Brenda and Cory for dinner. For dinner we went to a local Portuguese restaurant called Pedro dos Frangos where we had a filling local dinner of fish, breaded pork, fries, rice, spit-roasted chicken, melon wrapped with prosciutto and wine. It was very good and the price was very reasonable at only $45 Euros for dinner for four including a bottle of wine and a large bottle of water. We took a cab back to our hotel about 10 PM after some ice cream at another nearby restaurant…..no walking home!